You want a costume that celebrates America’s storied history of athletics. You enjoy the sound of the crack of the bat, the smell of hot dogs and beer, and the sight of thongs of fans crowded around to witness grown men in wool pajamas run around in a square. Well, you won’t have to sing “Take me out to the ball game” anymore. No, with this Adult Baseball Mitt Costume, you’re a baseball MVP––the game will come to you! 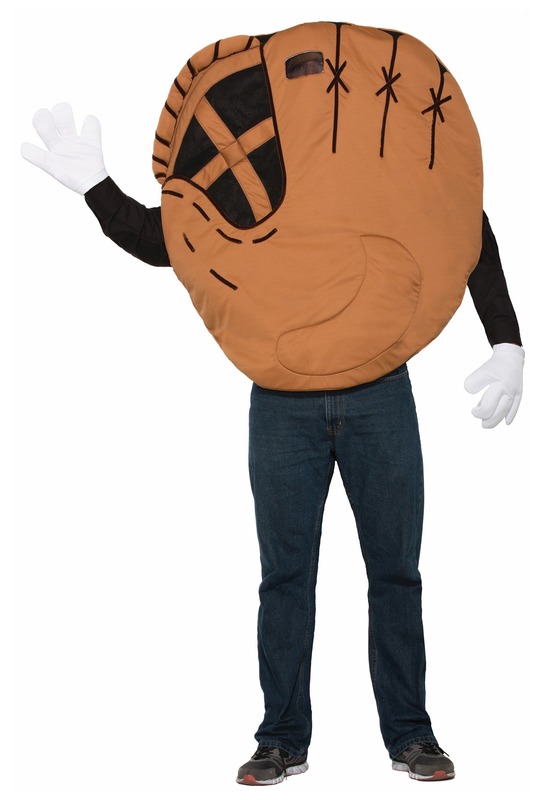 Just wear this baseball mitt costume and an impromptu baseball is sure to break out no matter where you are. It’s irresistible! Just find something to use as a ball and you’re all set. You could be in the aisles of the supermarket, and all of a sudden, batter’s up! An old man pitches an apple down the chips aisle. It’s a curveball, but a kid in a stroller-cart manages to hit it with a zucchini while her mom looks at the salsa display. You dive, catch the apple-ball right inside your glove-body, sliding into the frozen food aisle. It isn’t called America’s past-time for nothing! Gloves are a relatively new innovation in baseball. Did you know early baseball was played without a glove? Oh, yeah. And early gloves often left the players’ fingers exposed for “greater control.” Gloves as we know them didn’t become the norm until the mid-90s. Oh, right, the 1890s. So maybe they’ve been around a while. We said relatively! Never be without your catcher’s mitt again. This one’s not authentic leather, but rather, padded polyester. Oh well. No breaking-in needed for this glove, at least.